What does USA Hockey, Brazilian Football and Operation 36 Golf have in common? Reps...Reps...Reps! This past week I read an article that the sport I played since I could walk was seeing an incredible increase in participation. USA Hockey reported that they had over 107,000 8U participants in 2016-2017, which was the second consecutive year they had broken the record for participation. How do they get kids to play the game in its SIMPLEST FORM? After a little research, USA Hockey has been implementing an initiative for coaches across the country to use a ‘Cross Ice’ format. Traditional hockey rinks are approximately 200 feet long and 85 feet wide. Cross Ice Hockey divides the ice in thirds and games are played within an 85 foot long surface. This allows the coach to either have 2 games to be going on at once during practice or 1 game and the other half of the ice for skill stations, increasing the number of touches and plays that each individual player receives. Reps, reps, reps! This format of shrinking the playing surface to increase reps for the players is not new. Football (soccer for us Americans) has been doing this for quite some time. The best example of this is the great Brazilian teams playing Futsal. Futsal is a 5 v 5 football game on a smaller playing surface. Some of the greatest Brazilian players have been trained using Futsal including Pele, Zico and Socrates. Other countries that are seeing the benefit of Futsal are implementing this at the youth and national levels and calling it small area games or small sided games. The smaller playing surface with less players increases the number of touches and plays of each individual athlete. Reps, reps reps! The most popular sports in the world have determined over time and through studies that small sided games or shrinking the playing field increases enjoyment, engagement and allows players to be on a pathway to long term success. Why are we putting our junior golfers and beginners/intermediates on full tee golf courses? So they can blast a driver in the woods and score a 10? Why are we putting them 100 yards from the hole? From our experiences over the last 10 years, that is still too big of a playing surface for beginners and intermediate players that have a strong desire for skill development for the long term. Ultimately it is not a conducive environment for new golfers to find enjoyment, happiness and have fun with the sport. No wonder why we have so many that start the game with so much joy and excitement that end up leaving the game frustrated. We've had over 6 million people leave the game of golf from 2003-2015. 6 million! What we have done with Operation 36 is model the small sided game, shrinking the field model. We have taken a golf course that is built for adults and professionals and shrunk it to a size that even our youngest and most inexperienced players can play and have fun making pars, birdies and sometimes eagles each match. This has increased participation at our facilities and motivated juniors and now adults to want to come back to the course on a consistent basis to play the game. Reps, reps, reps! We’ve made it cool to shoot 36 or better no matter where you tee it up by posing it as a collaborative challenge to golfers. With our mobile app, players across the world and even at their home course, can see others playing the same game and they can like/comment to encourage each other in the journey to par or better. We are building a culture of coaches and players that understand you start close to the hole and work your way back as you get better. I liken this to the game PAC MAN. In the popular video game released in 1980 and still played to this day, the first level is pretty easy. My 8 year old son can pass the first level without much trouble. By the time he has advanced to the 10th board it is really challenging. This basic template of starting everyone at a level they can see success and then increasing the difficulty as they improve is how we created Operation 36. We wrap the playing component up with a coaching program that has 6 Levels and 12 objectives per level that the player advances through. The skills they learn during each objective are set up to specifically help them achieve success on the course. We train coaches around the world on how to deliver this 6 level learning system in small group formats using Training Environments. We provide a vast library of Training Environments specifically designed to be used during our Academy Classes and Supervised Practices to deliver a fun, exciting and purposeful experience for adults and juniors. For Golf Professionals to learn more about what we do, CLICK HERE. For New & Advanced Golfers who want to find a location CLICK HERE. The groundbreaking Long Term Player Development Guide for Golf in Canada was published in 2006. Credit needs to go to Golf Canada for being the frontrunner in producing this information for parents, coaches and players. Among those involved in this publication include the LTPD Steering Committee Members which includes our good friend Dr. Stephen Norris who has helped us at Operation 36 with many questions we have had over the years. Also credit to the LTPD Task Force Committee Members which includes another good friend Glenn Cundari who listened to our ideas when we first started in 2012 at the PGA Show in Orlando, FL and encouraged us to keep going! In the LTPD Development Guide, it is recommended that juniors age 8-12 participate in 5 to 10 golf events per year and be doing golf related activities 5 to 15 hours per week during the summer season. For 11-16 year olds they recommend 10-20 events per year and 7 to 9 months of training. We recently put together some metrics on our program below. We have used this guide and our experiences to put together Operation 36. It's very cool to see how close we are to the recommendations by Golf Canada. For example, a player in our program in North Carolina who participates for 8 months will play in 16 events. That's right in the middle of the recommendation. I will share that getting juniors to play in competition and play on the course is one of the biggest problems we have had to solve. We are excited that our players are playing the game, competing and on the path to success. 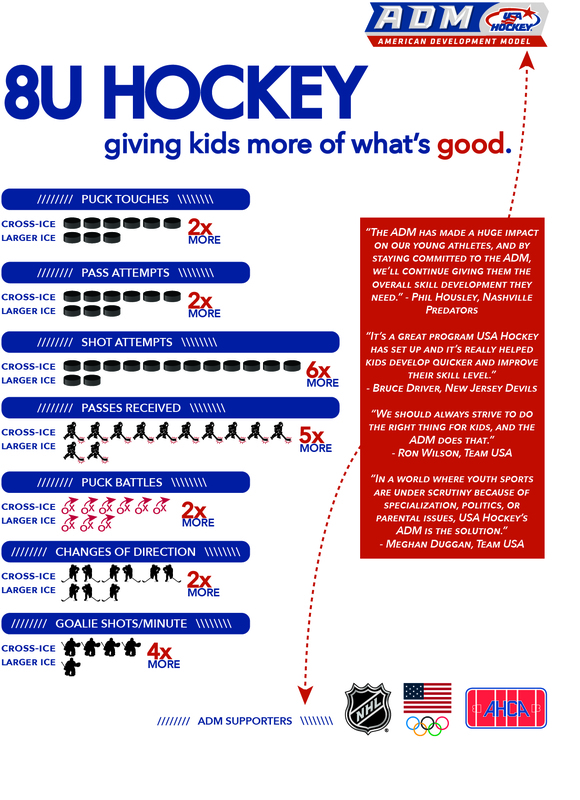 In closing, USA Hockey said it best, “the goal is to get kids to play the game to learn that it is in its SIMPLEST FORM, fun.” Golf is a fun game to play. It’s fun to write down a birdie, it’s fun to shoot 34 and know you broke par. We think that positive and happy experience should happen early on in a player's development and that’s why we believe in Operation 36. It delivers happy experiences to players of all ages at an earlier stage of development which then motivates a player to want to play more, practice more, improve and get better. Reps, reps reps!